If tomato paste is always something you're hunting for (how many times have you run out to the store in the middle of cooking? ), then it's time to memorize this substitution. 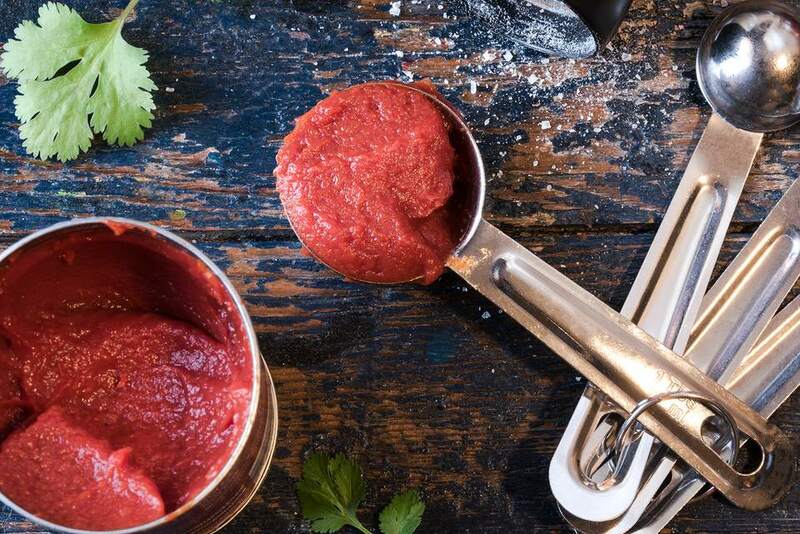 When you need a can of tomato paste or just a few tablespoons, but don't have any readily available in your pantry, you can substitute with thickened, concentrated tomato sauce or canned tomatoes. Blended canned tomatoes make a good substitute for tomato sauce for pizza or as a base for homemade pasta sauces. Pour a can (8 or 15 ounces) of tomato sauce into a saucepan and bring it to a brisk simmer over medium heat. Simmer, stirring constantly, for about 7 minutes, or until reduced by about two-thirds. Use a splatter screen to avoid a mess from the bubbling as the mixture thickens. You should have about 3 to 4 ounces of tomato paste from an 8-ounce can, or about 6 or 7 ounces from a 15-ounce can. Pour the tomato mixture into a saucepan. Bring to a boil over medium heat. Continue cooking, stirring constantly, for about 8 to 10 minutes, until thickened and reduced by about two-thirds. You should get about 2/3 cup or 6 ounces or tomato paste from a 14.5 ounce can of tomatoes. Note: To make tomato sauce from canned tomatoes, blend until smooth and use or cook over medium heat, stirring constantly, for about 3 to 4 minutes to thicken slightly. This Boiled Frosting Recipe is a Must-Try!